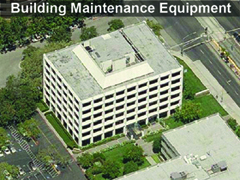 Architectural Engineering projects for Commercial and Residential clients, including Building Maintenance Equipment. Peninsula Covenant Church needed to document their facilities to determine how to serve the needs of the congregation and community. We prepared as-built plans of their entire campus and all of the buildings and calculated the legal occupancy of every room and building. Southward & Associates needed to improve the space utilization in their existing building and expand into to a neighboring building without interrupting their tax accounting business. We designed a continuous space using the two buildings, gutted one building at a time, modified the structure of both buildings to join them together, moved the employees between the buildings as work progressed during the off-season, and completed the entire project before tax time began. The California League of Conservation Voters needed a new headquarters. We redesigned the penthouse at 350 Frank H. Ogawa Plaza, a landmark Art Deco building in the heart of Oakland’s civic center, to serve their needs. An approximately 66,000 sf / $4M factory remodel project for Quanta Computers, Inc., in Fremont, CA. This was a multi-phase two-year project that involved mechanical, electrical, structural, egress, lighting, and accesibility upgrades to an existing building tilt-up concrete building with a wood-framed roof. The factory's production equipment was not part of the cost of this project. This work was done while an existing factory was in operation and was phased-out while the new construction was built. We started this project as a "simple" foundation replacement under a 1960's vintage home on the old salt-flats of Foster City. Given the extent of the required demolition, the owners then requested a second story over their garage and a new master suite. To enhance energy utilization, we replaced all the old windows and added insulation. 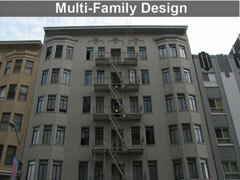 As part of the wall damage repair, we redesigned the entire façade to a Spanish Mediterranean style. Of course, we redesigned the interior. 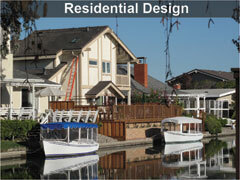 After almost 40 years, this contemporary home on one of Foster City’s canals was ready to be remodeled. We enlarged & combined the kitchen & family room into a great room. We enlarged & re-arranged the master suite to provide his & hers toilet & dressing facilities plus a private study overlooking the canal. We redesigned windows & eaves to control heat & light on the expansive southern canal exposure. We enlarged the formal dining room & tied it to a new exterior deck through French doors. We redesigned the upper deck to protect it from wind & rain. And we redesigned the back yard to create an outside entertainment area. Dr. Fuery purchased a beautiful turn-of-the century mansion in Piedmont, California. We were hired to design a two level addition on the residence. We also were hired to prepare cost estimates for numerous renovation alternatives that included an underground garage, expanded back yard with retaining walls and drainage, partial foundation replacement, a kitchen remodel, and repair of extensive decay and termite damage throughout the structure. California Culinary Academy needed to choose between renovating and replacing their existing dormitories. We inspected the buldings, prepared as-built plans, identified building components and systems that needed to be repaired or replaced, solicited bids, and categorized the work according to funding source, deferred maintenance, capital improvement, and life safety upgrade.